Lactose is a natural sugar that can be found in dairy products as well as in breast milk. Lactose is the main nutrient for babies and children, but its consumption is also very common in adulthood. Once it reaches the intestine, lactose is normally split into two other sugars, glucose and galactose, thanks to the lactase , a digestive enzyme of the small intestine. Because lactose isn’t as useful for adults as it is for children, the lactase activity may decrease after childhood. When lactase activity is too weak, some lactose is not digested in the small intestine. This phenomenon is called lactose maldigestion. Non-digested lactose ends up in the colon where it feeds the gut microbiota. Usually this lactose maldigestion is not noticeable and has no impact on health. It is the case for most individuals. But when it is associated with digestive symptoms, it is called lactose intolerance. Lactose intolerance is characterized by digestive symptoms, among which are bloating, diarrhea, flatulence. It seems quite easy to determine whether one is lactose intolerant or not. However, it is not possible to diagnose ourselves with lactose intolerance. When medically diagnosed, only one in two self-diagnoses is confirmed. That is why the medical diagnosis, the Breath test, is particularly important. The test is performed as follows. The patient consumes a standard lactose dose, between 20 and 50g, and the exhaled air is analyzed under medical control, to quantify the hydrogen. The hydrogen reflects the activity of the gut microbiota. When the hydrogen measured is high enough and at least one of the digestive symptoms quoted above (bloating, diarrhea and flatulence) occurs, the patient is diagnosed with lactose intolerance. Although lactose intolerance is quite common, very few people suffer from cow’s milk protein allergy. The symptoms are rather different because lactose intolerance isn’t an allergy. As for cow’s milk allergy, the main symptoms are hives, nausea, swelling and wheezing and they happen within an hour, but they can also be felt up to 3 days after drinking cow’s milk. In this allergy, the immune system overreacts when it meets proteins such as casein and whey proteins. What are the health risks of lactose intolerance? Lactose intolerance can generate discomfort daily. Still, it has no direct consequence on health. However, for most of us, even when properly diagnosed, removing any dairy product from our diet is not advisable. The major risk of lactose intolerance is to get health consequences from nutrient shortcomings. When one decides to entirely avoid one specific type of food, the body can lack of some nutrients and suffer from adverse health effects. For example the recommended daily intake of calcium could not be reached because of complete avoidance. This is the reason why many medical organizations such as NIH, EFSA and FAO*, deem that lactose intolerants shouldn’t avoid dairy products. Could dairy products be consumed by lactose intolerant? To avoid digestive discomfort, lactose intolerants should adapt their diet. For health reasons, such as risks of nutrient shortcomings, it is better not to completely remove dairy products. Instead of getting rid of them, lactose intolerants should favor some specific dairy foods. Lactose intolerants can keep eating products with little lactose, up to 12g by intake or up to 24g a day (that is to say one or two bowls of milk) without feeling any symptom. In order to do so, it is recommended to split the amount of lactose into several intakes, and to eat the dairy products during meals. Yogurt and other dairy products bring key nutrient for both adults and children. As for lactose intolerants, some cheeses, because they have little or no lactose, can help to get enough calcium. The yogurt is also particularly advised for its live bacteria, which enable the digestion of the lactose. 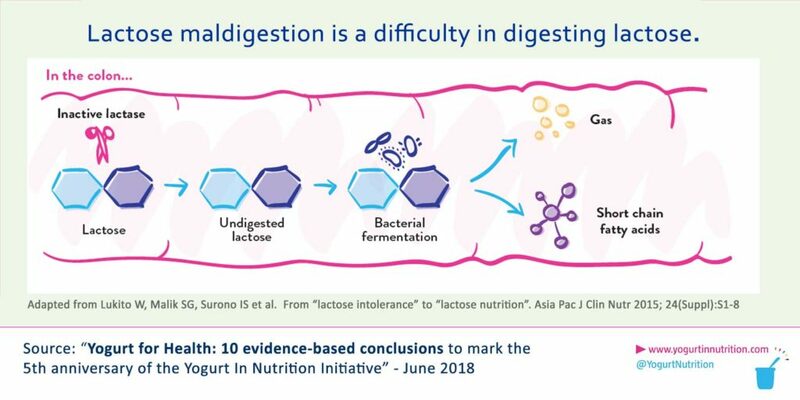 Moreover lactose intolerants who regularly consume food with lactose may even tolerate more lactose thanks to gut microbiota adaptation. Totally avoiding dairy foods is only necessary for infants with congenital lactase deficiency, which are very few. Could yogurt be consumed by lactose intolerants? Yogurt is full of good nutrients: Yogurt and other dairy products bring key nutrient for both adults and children. Indeed, yogurt contain all nine essential amino acids. Yogurt is also rich in several micronutrients of interest for bone health, such as calcium, vitamin D and potassium. 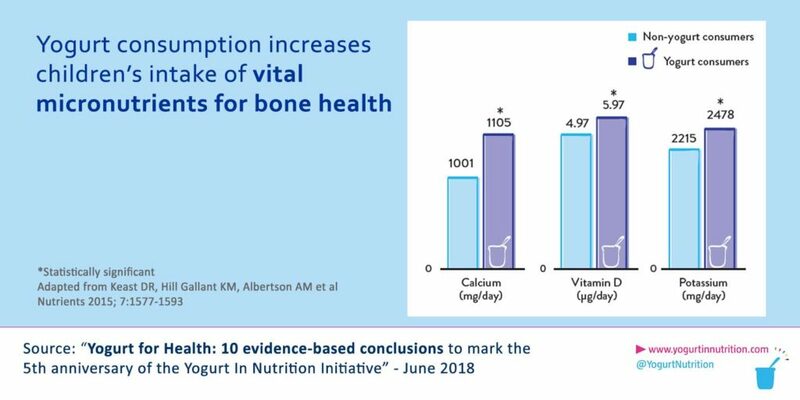 It has been showed that yogurt consumption increases the intake of vital micronutrients for bone health, among children. The live bacteria of the yogurt, Lactobacillus delbrueckii subsp. bulgaricus and Streptococcus thermophilus, produce their own lactase. Some of the lactose contained in the yogurt is broken down by this extra lactase . 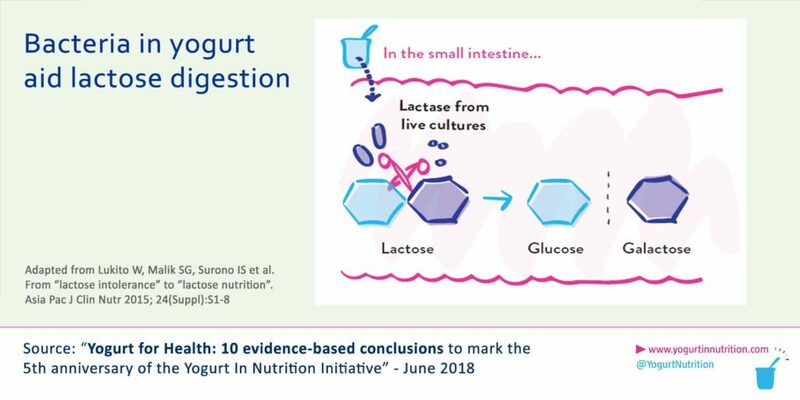 Therefore the lactose of yogurt is digested more easily than any other dairy product by lactose maldigesters and lactose intolerants, which is approved by the European Food Safety Authority. Yogurt is particularly advised for lactose intolerants by medical organizations. Most countries advise their citizens to have dairy products in their everyday diet. Several medical organizations (NMA, NIH, EFSA, FAO…)* recommend that lactose intolerants adapt their diet and favour yogurts. In addition, WGO advocates that everyone should consume fermented dairy products with probiotics, yogurt being one of them, in order to improve digestive health.